We have one blanket for CFK4! I just love granny squares! Just look at them! I started the blanket on the weekend that I launched CFK4, and finished it yesterday. How super quick was that? Nothing beats a simple granny square for speedy blanket making or for a super fun time playing with colour combinations. For the border, I used Border 138 from Around the Corner Crochet Borders book. It’s a striking border with a slightly raised ridge and very easy to do: just three rows of (UK) double trebles / (US) trebles, but on the second and the third rounds you work around the posts of the stitches in the previous round from the back. If each round is done in a different colour – in my case turquoise, grey and finally navy – it gives an really interesting effect. I don’t know about you about I always place my darkest shade at the very edge of my border. I think a dark colour on the outermost edge pulls everything together. Pattern: Traditional 6-round granny square, the last round of which is a different colour, arranged as 9 rows of 7 squares per row. Joining method: My Rose Valley’s Join-as-you-go method. I am relieved that I’ve done my blankety bit for CFK4. Even if no-one else sends me a blanket for the kidney dialysis patients I know there’ll be at least one that I can hand over to the nurses at the Royal London Hospital. I’m going to make one more blanket like this, but in shades of pink. Wouldn’t that look nice? Before I start the pink blanket though I think I want to finish my Marie Wallin Rose top first – especially as it looks like Summer has finally arrived in the UK. Warm sunny days are not the best time to work on a blanket! If you’re working on a CFK4 blanket, thanks! 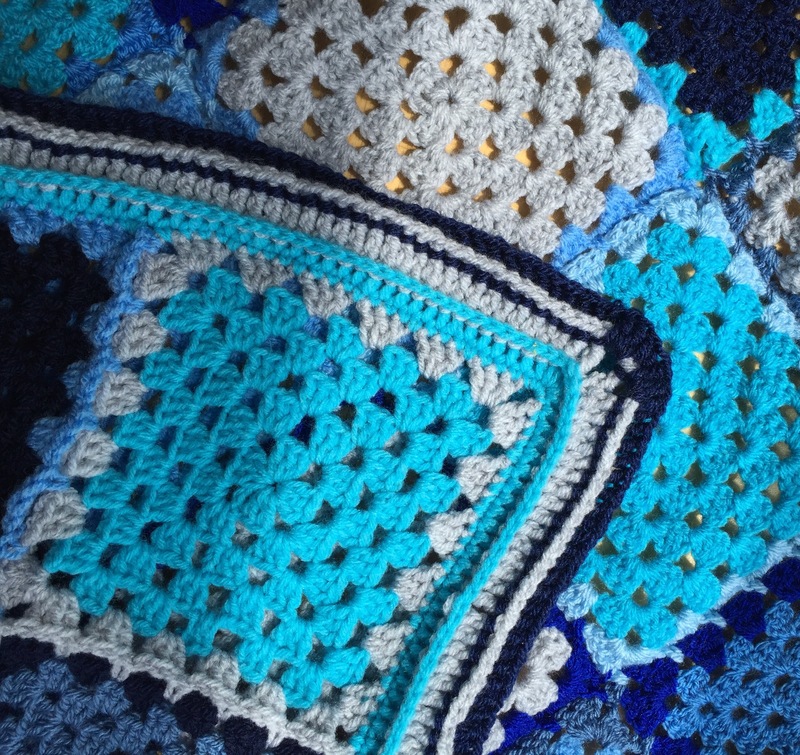 If you haven’t started yet, maybe you could consider making a blanket – it’s a great way to use up your stash and you’re make a comforting blanket for someone going through very unpleasant kidney dialysis. All the detail on Crochet For Kidneys Part 4 can be found in this blog post.